Steve Kline, Jr., the Research Analyst for Gardner Publishing (publisher of Modern Machine Shop and other trade magazines), started the Top Shops benchmarking report three years ago as a way for shops to compare themselves against other shops using Key Performance Indicators (KPIs). Last year, 357 companies completed the survey while 450 companies participated this year. The authors divided the survey respondents into three types of companies: Job Shops, Contract Shops, and Captive Organizations. 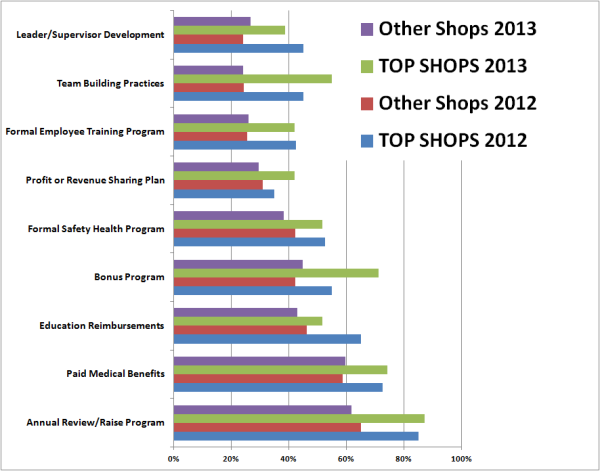 45% Job shops (independent shops that primarily perform short-run and other non-repeating work). 35% Contract shops (independent shops that primarily have contracts for repeating part numbers). 20% Captive organizations (an affiliate or subsidiary of a large corporation). The survey asks numerous questions about business performance. Please note: the charts illustrate Median values instead of Mean (average) values to give a clearer representation of the data. 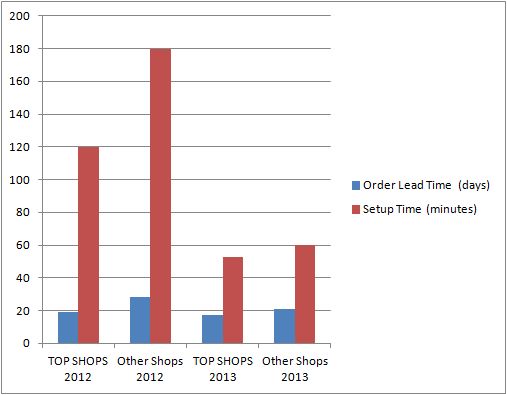 To see the data as averages, access the TOP SHOPS ZONEat the Modern Machine Shop website. The growth rate is defined as the current year’s sales minus the previous year’s sales, divided by the previous year’s sales multiplied by 100. Therefore, the formula for the Growth Rate in the 2013 TOP SHOPS Report is (gross sales 2012 – gross sales 2011/gross sales 2011 x 100). Therefore, it’s important to note that the 2012 growth rates are much higher because the formula is comparing growth from 2010, a recession year, to 2011. The profit margin is reported as net income divided by gross sales x 100. What I think is most interesting about this data is the fact that the profit margin has stayed relatively the same for Top Shops (12.9% and 13%) whereas Other Shops have increased their profit margin from 5.9% in 2012 to 7% in the 2013 report, which is essentially an 18% increase. Machining Time Percentage is calculated by dividing the amount of time that the part is being machined by the order lead time. Ultimately, a higher percentage denotes efficiencies in the work flow of each job. 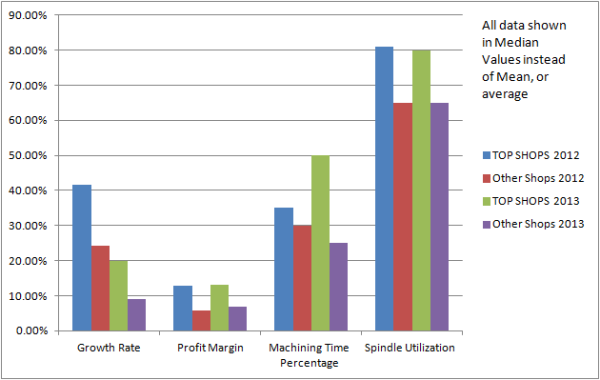 Spindle Utilization Time is the in-cut time as a percentage of machine uptime. 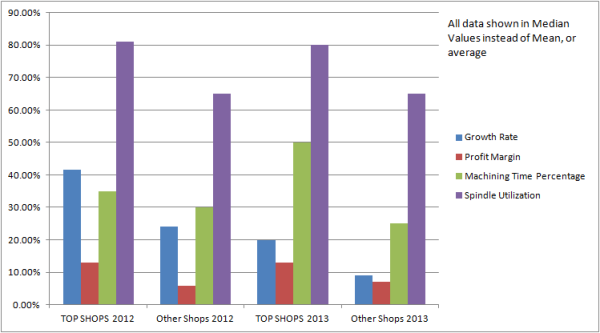 This chart show the same data discussed above, but with the axes switched so you can compare year to year for TOP SHOPS versus Other Shops. While both TOP SHOPS and Other Shops have seen improvement over last year in reducing lead times, the Other Shops have made a greater percentage improvement (28 days to 21.5 days, which is a 24% improvement in average lead time). 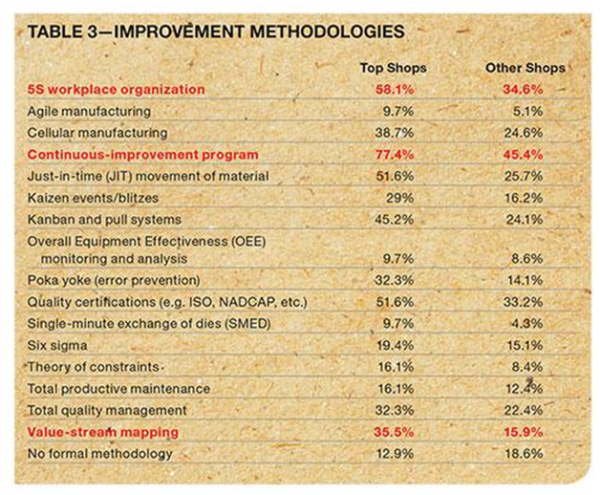 After reviewing the data from this report, I think there are four things that set TOP SHOPS apart from the Other Shops: greater investment in machine tool technologies and cutting tool strategies (see Table -2 from the TOP SHOPS Report), a commitment to Improvement Methodologies (see Table – 3 from the TOP SHOPS Report), and a commitment to Human Resources programs that reward engaged and motivated employees. Modern Machine Shop has a great article about applying improvement methodologies in a high-mix/low-volume environment “From Job Shop Chaos to Lean Order.” The article explains how a job shop clustered certain machines together by grouping parts that share similar routings into potential process families. 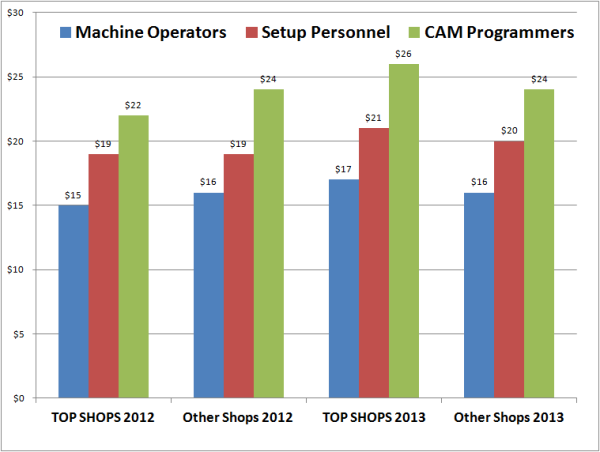 Even though it first appeared that Top Shops and Other Shops spent similar amounts on capital equipment, the authors of the TOP SHOPS Benchmarking Report said when they evaluated the amount of capital equipment spending per gross sales, it was clear that Top Shops spend much more of their revenue on machine tool technology—10% median and 13% average for TOP SHOPS compared to just 2% median and 6 % average for Other Shops. 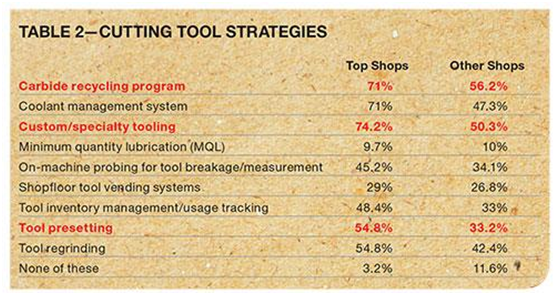 “The data is similar to our last two surveys, demonstrating that Top Shops continually make significantly larger investments in the latest machine tool technology,” according to the TOP SHOPS Executive Summary," according to the report's authors. Top Shops have a higher percentage of Horizontal Machining Centers (61% of Top Shops vs. 44% of Other Shops) and 42 percent of the TOP SHOPS take advantage of multi-face tombstones, which allows one HMC to achieve the productivity of two or more VMCs, according to the authors. Due to the number of tools HMCs hold versus VMCs, the HMCs can accommodate a higher number of jobs without changing/adding tools. 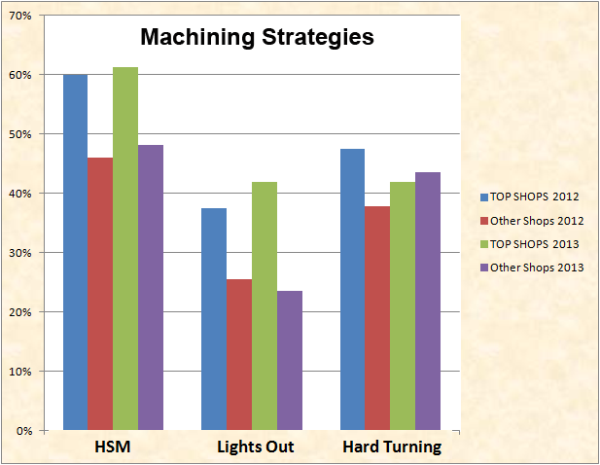 Modern Machine Shop has a great article in their February 2013 issue “Worth Three Machines,” where a shop determined its new HMC delivered productivity comparable to three VMCs. The percentages are quite different this year compared to last year’s survey for the percentage of TOP SHOPS using mill turn multi-tasking centers—nearly 50% last year and just 29% this year. I’m curious to know if our blog readers have any idea why that percentage would drop so much? At Hurco, we’ve focused an enormous amount of our resources on 5-axis technologies because we think it’s the most expedient way for shops to increase profitability—especially in the “high mix/small batch” world in which many of our customers operate. The idea is to significantly decrease setup time by using 5-sided (or positioning only) on existing parts with the opportunity to bid on higher margin Simultaneous 5-Axis (or full contouring) jobs when you’re ready. 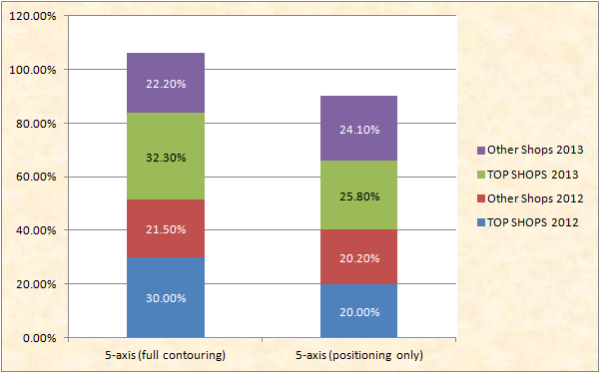 From this year’s Top Shops report, it appears all shops are increasing their investment in 5-axis machining centers, but TOP SHOPS continue to have a higher percentage of these machines and continue to grow the Full Contouring 5-Axis part of their business. If you still haven’t made the leap to 5-axis, check out FiveAxisMachining.com, an educational website sponsored by Hurco that has lots of resources to get your started. One of the most popular resources is the interactive worksheet that lets you easily evaluate whether you can increase your profit margin on existing parts by switching from 3-axis to 5-axis positioning (or 5-sided machining). In addition to higher investment in machine tool technology, cutting tool strategies, and continual improvement programs, Top Shops invest in their employees. The hourly wage Top Shops pay their manufacturing personnel is about the same as other shops, but Top Shops invest in programs that focus on personal growth (Leadership Development, Annual Review/Raise Program, Bonus Plan, Formal Training Program, Teaming/Team Building). At all levels, it appears the companies deemed Top Shops continually invest in their business—their employees, their equipment, and improvement programs. Thanks to Modern Machine Shop, Gardner Publishing, and the report's sponsor, AMT, for this valuable resource! Please leave your comments and share this post with friends/colleagues who are interested in data about manufacturing companies.